Top row, from left to right: moist evergreen forest on Mt. Panié (about 1200m) and on Mt. Mou (1160m); maquis vegetation on the Plaine des Lacs. 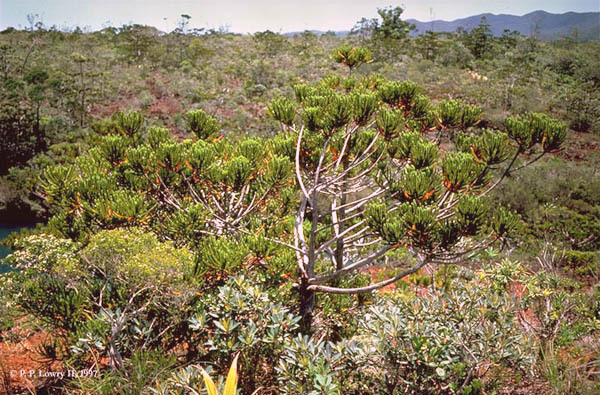 Bottom row, left to right: coastal forest with Araucaria columnaris at Port Boisé; population of Araucaria humboldtensis on the upper slopes of Mt. Humboldt (ca. 1400m). The following paper was presented at the International Symposium entitled "Rare, Threatened, and Endangered Floras of Asia and the Pacific Rim", held at the Institute of Botany, Academia Sinica in Taipei, Taiwan, 30 April - 4 May 1996. 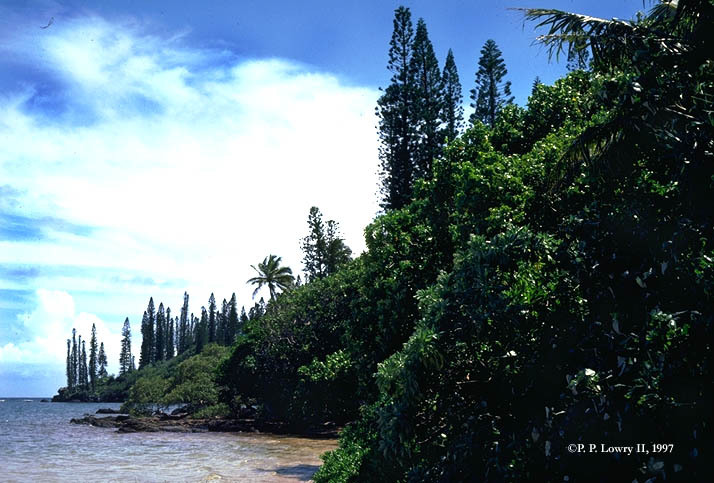 The printed version with expanded text has now been published in the symposium volume (Lowry, P. P., II, Diversity, Endemism, and Extinction in the Flora of New Caledonia: a Review. Pp. 181-206 In: C. -I Peng and P. P. Lowry II (ed. ), Rare, Threatened, and Endangered Floras of the Pacific Rim. Institute of Botany, Academica Sinica, Monogr. Ser. No. 16, Taipei). Reprints are available from the author (lowry@mobot.org or lowry@mnhn.fr). The southwest Pacific island of New Caledonia, covering approximately 17,000 km², has a remarkably diverse and highly endemic flora for an area its size, with an estimated 3,137 native species of angiosperms and gymnosperms (79% endemic), representing about 763 genera (14% endemic), and 169 families (3% endemic). 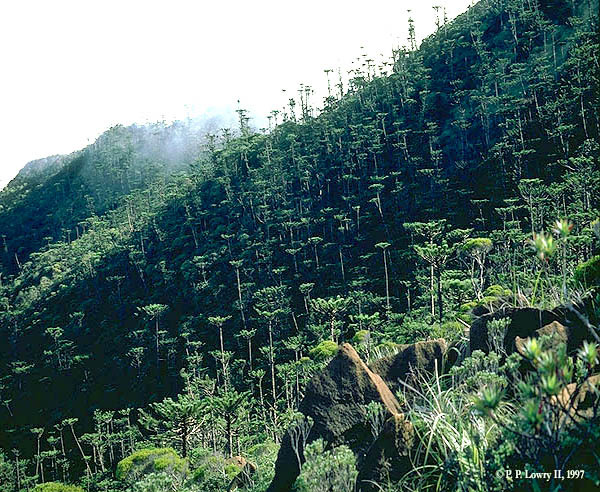 Numerous relict endemic lineages occur on the island, such as 14 gymnosperm genera, with 44 species (98% endemic) representing 7% of the world's total, and members of many primitive angiosperm groups (e.g., Winteraceae, Amborellaceae, Monimiaceae, Annonaceae, Chloranthaceae, etc.). New Caledonia separated from Australia about 65 MYBP and reached its present position around 50 MYBP; during the Paleocene and middle Eocene peridotites covered the island resulting in ultrabasic substrates that still occupy about a third of the surface. Many members of the late Cretaceous - early Tertiary Gondwanan flora survived in New Caledonia's equable climate but were eliminated in Australia due to increasingly dry conditions. 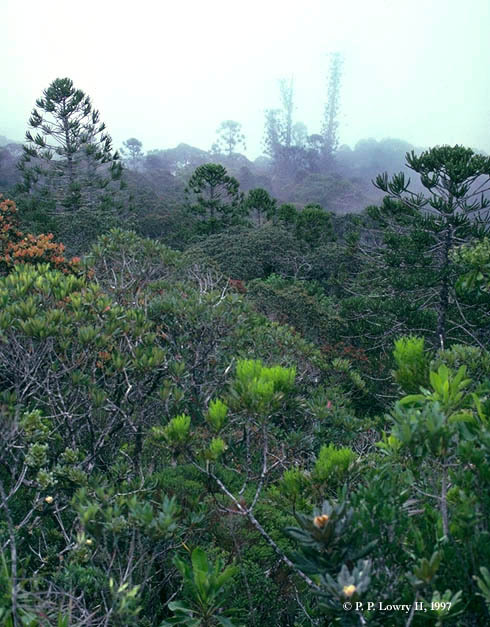 The island's geography and climate today have resulted in a wide range of vegetation types; recent studies show that specific endemism is highest in maquis vegetation (91%), a characteristic scrub-like heath on ultrabasics, and in rain forests (87%), which occur both on and off these substrates; endemism is lower in the remnant stands of sclerophyllous forest (59%), which are New Caledonia's most threatened habitat type, covering only 2% of the its original approximately 4,500 km2. 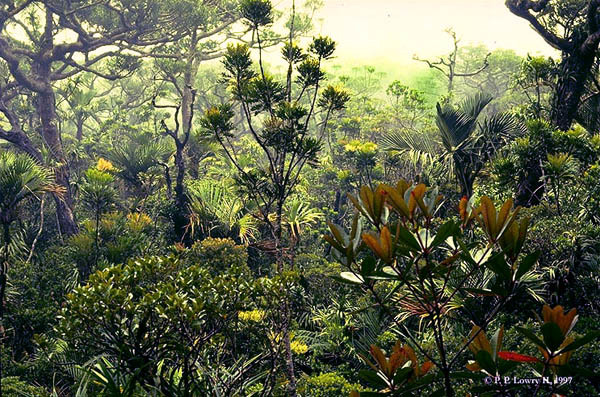 An estimated 50 species face impending extinction or have already been lost from the New Caledonian flora. The threat to the flora and vegetation in the other principal habitats is currently much lower than in most tropical areas because of the island's comparative political and economic stability, but this situation could easily change.